New year, a new version of Testlab. We are glad to announce a new version of Meliora Testlab – Plumbbob. This release includes multiple new features including Radiators. 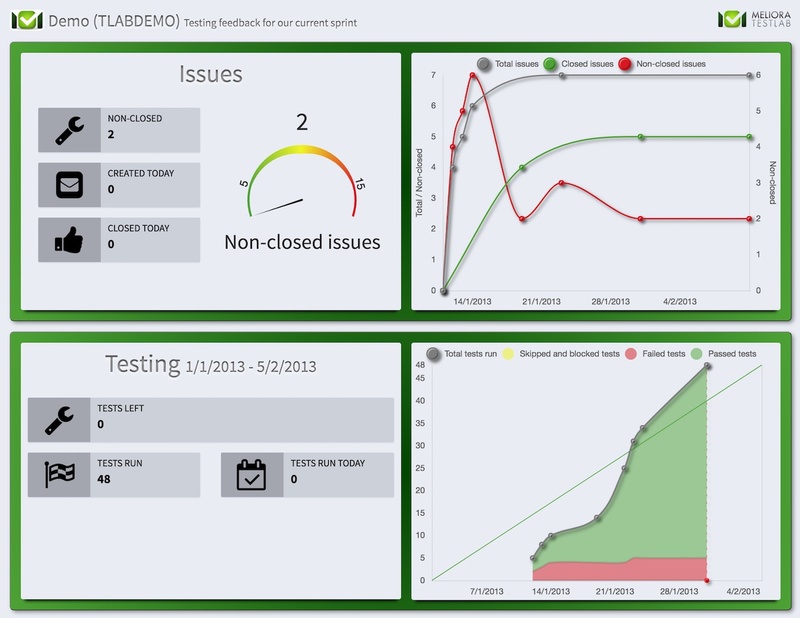 A Radiator is a new reporting related concept which aims to help you track the progress of your testing in real-time. Please read more about the new features and changes in this release below. Radiators – a new reporting related concept introduced in this release – are real-time views to your project data refreshed at frequent intervals. Radiators differ from regular reports in a sense that the regular reports are intended to be ‘printed on paper’ as radiators are intended for real-time tracking from a display screen. Testing feedback radiator, which shows the current situation of issues and testing in progress. Multi-radiator, which allows you to configure multiple (single-)radiators to be shown in regular intervals. More radiators for specific tracking purposes are to be added in future releases. Note: A Radiator is protected by a password which is needed to display it. Opening up a radiator (or multiple radiators from a single browser) consumes a single license from your license pool. For the time being, Radiators are also usable in Self-service subscriptions – so feel free to try them out! Test coverage view has been added with a search-word based filtering function which can be used to filter in relevant data to the coverage grid. The filtering itself works similarly as it works in the requirement or test case trees. For example, in Test case coverage, filtering with “priority:high” filters in coverage only for “high” prioritized test cases. Most grids presenting data have row-specific controls which are represented by small buttons shown at the end of the row when the mouse cursor hovers on the row. In Plumbbob, you can also access these functions via a context menu which is shown when you click the right mouse button on the row. When managing test cases you can copy test cases around in your project using the left-hand side test case tree. The tree has been added with a “Paste special…” functionality, which enables you to select the content copied for selected test cases. 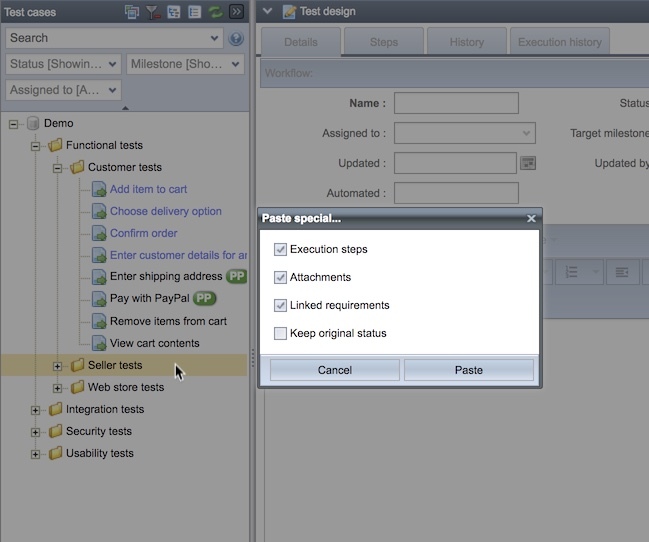 For test cases, you have an option to choose if you want to copy the steps, attached files, linked requirements and optionally, copy the test cases by retaining their workflows status instead of copying the test cases to “In design” status. To ease managing your testing, test cases in test runs can now be assigned to individual testers. When a test case to be run is assigned to a tester, Testlab automatically selects these test cases for testing when this tester continues his/hers testing. When your team works in Testlab events are shown in the top right corner of the UI. In Plumbbob, you have an option to hide these event messages but at the same time, go through them at the later time. 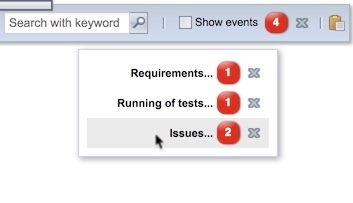 All events received are stored and categorized behind a red indicator. When clicked, you can read through them and/or dismiss them permanently. most grids and reports now have an option to filter in assets by defining “Milestone: No milestone” criteria. At the Nevada test site, in the mid 1957s, United States conducted the biggest and longest series of nuclear tests ever in the continent. The operation was called Operation Plumbbob. The scientists were worried about the radiation spills to the atmosphere. To go around this issue the Operation consisted of nuclear blasts conducted underground, in deep boreholes. 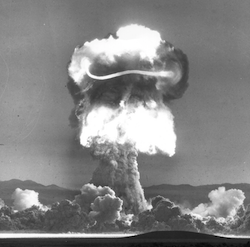 These were to become the world’s first underground nuclear tests. In a test codenamed Pascal B, the team experimented on how the air pressure affects the explosion and radiation spread. The borehole was welded shut with a 900 kilogram (2000 lb) steel cap. Then the a-bomb at the bottom of the shaft was detonated. The steel cap over the detonation was blasted off at a speed of more than 240 000 kilometers per hour (66 km/s, 41 mi/s, 150 000 mph) which has been the topic of some discussion later on. As the cap was never found, it has been speculated that as the cap easily exceeded the escape velocity of the Earth, the cap (or part of it) would be the first manmade object to orbit the Earth. This would beat the Sputnik launched in October 1957.